Yes, I know I skipped September, it is still in the works but having digital camera issues. I can't seem to get good closeups. Does anyone know how to adapt a macro lens to an HP Photosmart 435? I will have December out asap, just a bit of editing and an animation to finish up. First a character based video terminal circuit idea that is implemented with a PIC 16F627 using the hardware USART to shift out character pixels. This allows for the much slower running PIC to still generate a 16*10 char display with 64, 8x8 pixel characters. Yes, an SX or other high speed processor could bit bang it, but shift register chips are cheap and allow for that much more processing or lower clock speed (and lower power, heat, etc...). For more details (in French) see the authors site at : http://perso.wanadoo.fr/phmworld Bablefish does pretty well with it. Other than the idea of using a USART, I really like the diode AND gate in the D2A converter which allows 4 levels of grey on the display. Because of the slow processor, he can only change the grey level between character, but that is all he needs right? http://www.rickard.gunee.com/projects/ Rickard is the king of bit bang video! He even has an SX doing color, and nice color at that! http://linkline.com/personal/msaavedra/3Chip/3chipinfo.html Sneaky SX tricks to make a cable TV descrambler. Lots of good info on video there. http://techref.massmind.org/techref/datafile/charsets.htm Character set data for several fonts, utility to extract characters from images, convert fonts to data tables. http://techref.massmind.org/techref/io/video/ntsc.htm NTSC signals and why. IBM's official method of recognizing their original EGA graphics card was to look for the string "IBM, Inc." (or something like that) at a certain address in the card's ROM. 3rd party EGA cards simply put "Not a product of " in front of it - satisfying the protocol, without committing a copyright violation. Just because we CAN bit bang doesn't mean that was always MUST. If a bit of external logic allows us to get even more done, why not use it? Here is a circuit idea for an SX plus shift register video terminal. I think you could get to 80 by 24 pretty easily with this. Of course, that requires a text memory of 1920 bytes, but we should have enough time left over to read an external RAM. Add'l circuitry to generate blanking and sync from PIC outputs not shown. 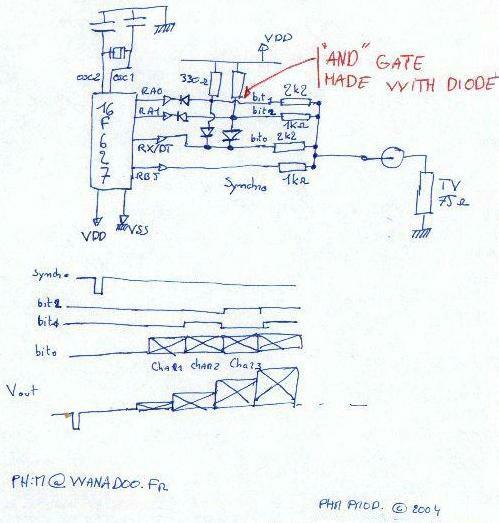 The '04 inverter can obviously be replaced with another NAND gate from the '00. Or all the 74HC stuff can be put into one CPLD. One flip-flop is used to divide the oscillator clock to get the shift clock. The other is used together with the gates to produce a parallel load enable for the shift register. The parallel enable needs to be only one dot clock wide, but the narrowest pulse the firmware can produce on a port pin is two dot clocks wide. The firmware generates a two dot clock wide positive-going pulse, we use a flip-flop to delay it one dot clock, then NAND it with the undelayed pulse producing a negative pulse one dot clock wide. The inverter on the flip-flop clock is to make it negative-edge-triggered, so that the parallel load enable of the shift register will be stable during its clock input transition (rising edge). If we must bitbang, how do we do it? Here is the standard methods followed by some "tricks"
The most obvious way to get a really fast shift register is to just rotate the bits in a port. Of course, you have to set every pin to output and leave them unconnected. It wastes an entire port, but it does have the advantage of being bloody fast. Since each pin's state must be read back into the uC before it can be shifted and sent out to the next pin, Read / Modify / Write problems are a possibility. For example, if B.7 is set and B.6 is cleared, then when you rotate the port right, the 1 from B.7 is applied to B.6. But things don't happen instantly, not even in a 75MIPS processor! As the port starts to drive B.6 high, if another shift is performed before it makes it above the point that defines a logical one, B.6 will be read as a 0! The result is that B.5 will be set low after this second shift and will loose the bit that was originally set in B.7. The sample code I'm going to paste in here is from a high speed UART application, and the bit of code before the actuall rotating of the port is so neat I'm going to leave it in, even though it doesn't really relate to video applications. This gives only 2 cycle per bit which is quite fast and doesn't waste any port pins. It can cause Read / Modify / Write problems however, so it would be best if the other port pins are unused or inputs. This one is unique in that as long as the remaining 3 bits of RA are set to input, no pins are wasted AND it can't cause Read / Modify / Write problems! This code generats character video using the lower 4 pins of RA as a shift register. RA.0 is the output, but RA.1 - RA.3 must be set to outputs and left unconnected. Each entry in the character generator table needs to have bits 8..11 (the top 4 bits of the 12 bit word) set to the top 4 bits of the address of that word so that when M is loaded by the IREAD, its value is retained. ;An extra cycle or 2 here just spaces the characters a bit more. VGA is actually actually just about the same as standard NTSC, just some different timings, and three seperate color inputs. 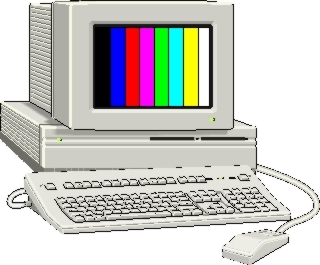 There are three signals -- red, green, and blue -- that send color information to a VGA monitor. These three signals each drive an electron gun that emits electrons which paint one primary color at a point on the monitor screen. Analog levels between 0 (completely dark) and 0.7 V (maximum brightness) on these control lines tell the monitor what intensities of these three primary colors to combine to make the color of a dot (or pixel) on the monitors screen. Technically VGA video has 480 lines and each line usually contains 640 pixels. In order to paint a frame, we require two synchronization signals in order to start and stop the deflection circuits at the right times. The timing for the VGA synchronization signals is shown here. Negative pulses on the horizontal sync signal demark the start and end of a line. The actual pixels are sent to the monitor within a 25.17 ms window. The horizontal sync signal drops low a minimum of 0.94 ms after the last pixel and stays low for 3.77 ms. A new line of pixels can begin a minimum of 1.89 ms after the horizontal sync pulse ends. So a single line occupies 25.17 ms of a 31.77 ms interval. The other 6.6 ms of each line is the horizontal blanking interval. In an analogous fashion, negative pulses on a vertical sync signal demark the start and end of a frame made up of video lines. The lines are sent to the monitor within a 15.25 ms window. The vertical sync signal drops low a minimum of 0.45 ms after the last line and stays low for 64 ms. The first line of the next frame can begin a minimum of 1.02 ms after the vertical sync pulse ends. So a single frame occupies 15.25 ms of a 16.784 ms interval. The other 1.534 ms of the frame interval is the vertical blanking interval. 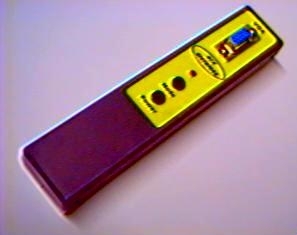 VGA Monitor tester with SX chip. This simple software makes a color bar or cross-hatch pattern on PC VGA or SVGA monitor. Its very simple just look at the circuit for all pin definitions. The pins ra.0 to ra.2 are the respective outs for blue, red and green signals, and rb.0 and rb.1 the sync H and V. The rb.3 pin is used to change the mode, from bars, to cross-hatch. Really, there is not too much that I can say about the project; the SX software generates all the signals, keeping count of the clock cycles. Look at the code and you'll have a better idea of how it works. I'm using it to test many monitors, and it gives me a good result. I have found that in some cheap Samsung or Goldstar monitors there is a difference in the V size. You can put it all together in a little box to bring it with you in your pocket. ;		It generates color bars and white lines in 640x480 mode. ; tambien lleva el sicro H esta.